An Incredible Ocean View Apartment located in Vista Mare with a fully equipped kitchen, spacious seating area, and two bedrooms with a king size bed and two full size beds uniquely designed with a private beach and breathtaking views of Cayo Levantado. 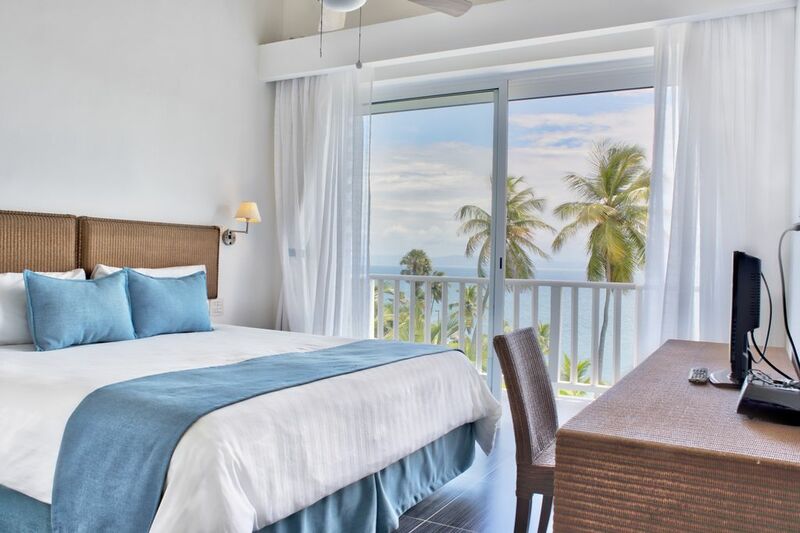 This two bedroom apartment gives you access to our two oceanfront swimming pools, two exclusive beaches, Internet access in common areas, Cable TV, and to our stunning ocean view restaurant where you and guests will enjoy the most delicious options in Samaná! Great view, nice restaurant, close to every beach and outdoor adventure in the area. Hello Tomas......Vista Mare is in a stunning location......my 2 adult daughters and I had a wonderful restful week. Your unit was beautiful.....however, there were a few inconveniences......no hot water in master bath shower the entire week......very little water pressure in shower in 2nd bath....could not get dishwasher to work....a microwave would have been appreciated....on the plus side.....the outdoor furniture was so comfortable and well used by us all.....the open layout and the floor to ceiling windows were just beautiful, beds very comfy,washer/dryer very convenient .......not really sure why the service is soooooo sloooww in the restaurant, especially when you are the only patrons present (we were literally in the restaurant for 2.5 hrs one morning for breakfast)......but if that issue could be improved, the venue would be perfect thanks!! Wonderful Views of Ocean -- No Outdoor Furniture to Enjoy It!! LIKES: The views were incredible from the unit, club house, pool, restaurant. The unit was a nice size, with floor to ceiling windows so you can enjoy the view. The restaurant food was very good -- the service a bit slow. They do offer a meal plan or you can just choose off the menu for a varied fee per dish. The 2 pools were great--we could even see whales in front of the property. The 2 private beaches on the property were amazing. DISLIKES: Biggest complaint about this particular unit -- THERE IS NO OUTDOOR FURNITURE to sit on and enjoy the scenery!!! The indoor living room furniture is extremely uncomfortable and of a very low quality. There was no microwave in the unit. Also, the unit has this great Jacuzzi tub on the deck -- but we were unable to use it for it had no water in it. The mini market on property should just close for what they have to sell -- basically nothing!!! When renting in this area be sure to stock up at a grocery store (super Mercado) before you get there for there is no where to purchase items that are needed -- for example we needed laundry detergent could not find any. The complex of Vista Mare is so hilly that it is recommended you drive from your condo up to the club house area -- there was no way that my mother over 60 was able to walk up the hill. Also it is very dangerous to walk up for you are walking on the road -- there is no suitable staircase or walking path when staying in the buildings closest to the sea (where this unit is located). To wrap it up -- I would stay at the property again (not this unit unless they made some changes/additions). I would make sure we were better prepared with items that you need for a condo rental unit. 50 minutes from Samana International Airport (AZS) served on Wednesday and Friday by Jet Blue from NYC-JFK Airport.